The answer is… it depends! It depends on what you need and the skills of the people you hire. But I thought it would be helpful to talk about some of the roles you might want to fill. First, before we get into roles, you have to consider whether you’re going to hire a contractor or bring in someone in-house. I’m not an employment expert, but I know there are different legal considerations when it comes to whether you keep someone as a contractor or as an employee, so check your local requirements when making a decision. How much can you afford? A contractor is set up to be able to afford to give you just a few hours a week, whereas an employee has to be at least 20 hours a week — and whatever salary comes with that. The flip side is that the contractor will probably be much more expensive at 20-40 hours a week than an employee on salary would be. How many roles do you need to fill? We’ll discuss this more below, but the number of roles you need to fill will also determine who and how you hire. You may get lucky and find a unicorn who can do everything you need… but that’s rare. It’s more likely you’ll need a small team to cover all the roles, and that may influence how you hire. This is why we offer a “content team in a box” so to speak — a solution for people who need to fill more than one role, want to work with experts, but aren’t ready to hire an entire team full (or part) time. In our experience, the first thing people think of when they start outsourcing content is the writing — the actual content. But there are lots of other moving parts that you could and may want to outsource. Strategy and planning — This could be your role if you love strategizing your own marketing, or you might want to hire a consultant to help you. This is my jam, and I’d love to work with you, of course. This role isn’t generally one you’d bring in-house until you’re ready for a marketing director (see below). Writer — Having a content writer is the biggie that everybody thinks about, but you should consider WHAT kind of content you want your writer to handle. Most writers have a breadth of capability, but also a particular niche they prefer to write in and are most successful at. 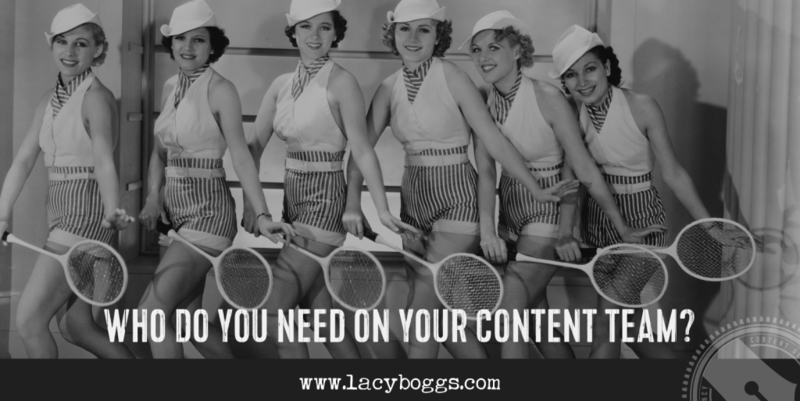 So think about the kinds of content you want, which might include: blog posts, emails, website copy, social media updates, ebooks and white papers, etc. Graphic Design — One of the first task I outsourced was graphic design, someone to find and create an image for my blog posts and social media. Depending on your needs, you might also want someone who can create documents, email headers, and other designs for you. A subset of this might be a photographer to help you create images you might need. Social Media — There are a lot of levels of social media management, including strategy, creating posts, driving engagement, running growth campaigns, interacting (customer service) and more. Video / Audio Production — Depending on the types of content you create, you might need an audio or video producer to create professional content. Ads Manager — If you run any advertising, you’ll want a dedicated ads manager. This could include just running the ads for you all the way through to strategy and creating the content for the ads. Email Manager — If you use a complicated email system like Infusionsoft (and even if you don’t, but just don’t want to do it) you might need someone to help you create your email autoresponder sequences and manage your database. Metrics & Analytics — One important part people forget is to track the metrics and analytics that will tell you if your content marketing is working. This could be a task for an assistant who simply pulls the numbers each month, or you might want a dedicated person to help you track your data. SEO — If organic traffic is important to your promotional strategy, you’ll want to include an SEO expert on your team who can help you get your content ranked by the search engines so more people can find you. Public Relations — If you want the media to be one of your main ways to promote yourself, a PR expert is a good addition to your team. They can do everything from pitch you for podcast interviews and guest posts all the way up to working on getting you featured in Oprah Magazine or on The Today Show. Editor / Marketing Manager — Finally, once your team gets large enough and your marketing complicated enough, you’re going to want someone who is in charge of everything. Whatever you call her, she’s making sure that everything runs smoothly. Woah! Do I really need all those people?! If you’re freaking out a little at that list, please don’t: You don’t need all those people all at once, certainly not to begin with, and maybe not ever! It all depends on your particular strategy. Some of these roles may be short-term or one-time contracts. For example, you might work with an SEO person to update your site and identify your keywords, and that’s it. Or you might engage a PR person for a six month engagement to promote a new product or a book. Plus, especially when you’re starting out, you can probably find one person to fill several roles. For example, if you have a writer and a graphic designer, they can almost certainly work together to produce your social media posts. You might have one VA who can upload your blog posts, schedule social media posts, schedule emails, and pull your metrics data for you. And once you have a marketing manager, she should also probably be in charge of big picture strategy, and may also be the one writing the content. The combinations are endless, and really depend on the people you find to fill the roles. The next obvious question is to ask where you should start when you’re looking to outsource your content marketing. Or the person who will free up the most time for you to stay in your zone of genius. For a lot of our clients, a content writer ticks one or more of those boxes — and a content team (through Content Direction Agency) can tick many different boxes. The object of this list is not to overwhelm you, but to show you the range of possibilities of people that you might want on your list. From a self-serving perspective, it’s also to point out that we offer most of the services on this list — and if we don’t offer it, we can recommend someone who does. And finally, it’s to show you that if you’re trying to fill all these roles by yourself… well, it’s no wonder you’re exhausted!